We offer outdoor activity and field study courses to Primary and Secondary schools, and our facilities are available to other groups or individuals throughout the year. The Centre is situated in beautiful countryside on the border between England and Wales, near the small market town of Hay-on-Wye. It has extensive grounds which offer potential for various activities, being close to the Black Mountains, Brecon Beacons and the River Wye. The centrally heated house accommodates up to 50 guests, in shared dormitory style rooms with bunk beds and washbasins. Toilets and showers are situated nearby. Accompanying staff or group leaders have separate rooms and bathrooms. We also have a purpose built indoor climbing wall, classroom and conference room. Our programmes are prepared in consultation with visiting groups, and are carefully tailored to meet their needs. However, to keep costs to a minimum, visitors are expected to assist with domestic chores such as setting and clearing tables, washing up and preparing packed lunches. Safety is a prime consideration and Trewern operates within the rigorous standards laid down by the Adventure Activities Licencing Service. Qualified Teachers lead curricular sessions and all instructional staff hold a range of nationally recognised qualifications in outdoor activities. 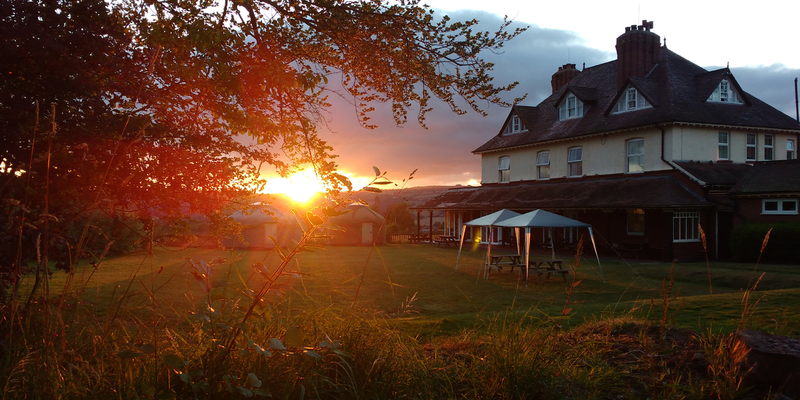 Whether you want to scale the mountains of the Brecon Beacons National Park, explore our rivers by canoe, venture underground or simply enjoy a local walk, taking in some of the many bookshops in Hay-on-Wye, Trewern is the ideal place to stay.